Blogging is hard work and takes up a lot of your time. It's true, it does but if you still to it - it's so worth it. Whoever said blogging was easy, really never had a blog. There is no good doing one blog post a month and thinking you'll become the next Zoella as it's just not going to happen. You have to love what you do. You will spend ages blogging, taking pictures, etc so you really have to put in the time and effort, and actually love what you do. Your opinion matters and not everyone is going to agree with you or be your friend. Everyone has a different opinion and it may not to be same as yours but what you need to understand and realise is that your opinion matters just as much as everyone else's. Your friends and family won't always understand how much this means to you. No one will, apart from you. And that's okay. Help them understand, show they your blog and how much effort you put into it. They won't understand it because they don't know about it, help them and learn them. If you wouldn’t say it in real life then don't say it online. Be nice. everyone is fighting their own battles. Even if someone has said a nasty thing about you, don't let it get to you. Just shrug it off and remember; not everyone is going to like you. You are not alone. The blogging community can be a wonderful place. There are so many people out there that can relate to you. You'll befriend so awesome people, some will even become your close friends, and you'll build up your own little blogging family. Remember; friends are the family we choose for ourselves. Weither you're a full time blogger, a part time blogger, a spoonie with #SpoonieBloggers, a nerd with #NerdyBloggers, a vlogger with YouTube, or everything in between and more - #TheGirlGang and the whole blogging community are there for you. Twitter, Instagram, Facebook, YouTube, SnapChat, Pinterest, Tumblr. Sharing your blog as much as possible and time management is everything, so schedule posts and tweets to keep everyone updated on what you and your blog are up to. I personally use Hootesuit.Com and I love it! Also talk to other bloggers and brands and PR companies, be friendly and open and show everyone how much you love your blog and how proud of you are. You have to understand simple HTML and CSS coding. If you're no good with these things then don't worry! You can learn. Google it, or ask another blogger. Feel free to always ask me if you want to, I don't mind at all. I love helping fellow bloggers out with anything and everything! But you need to be able to manage your blog yourself so you can put your own personal touches on it. You'll get a lot of spam and will be messed about by people. So many companies have contacted me and asked to work with me, then three or four emails later they will explain that they want me to buy their product to review. But it's okay I can have it at a discount price of £65 instead of £80 (without P&P) - which yes is awesome but also means that they want you to buy their products, use it, put your time and effort on the line writing a blog post, taking pictures and scheduling tweets and things to advertise it, basically for free for them. This is where you have to put your foot down and say no. Sponsorships don't come easy and you don't get buckets of free stuff. Writing not just a beauty blog can be expensive, and you'll buy pointless useless stuff for background purposes in pictures and then have no where to store them. As long as you can edit your pictures. A picture truly says a thousand words so try and get the best picture you can possible. Blogging doesn't make you money instantly. Don't think that you'll start a blog, do a few posts and companies will want to send you stuff and sponsor you because it really isn't like that. Blogging really is hard, hard work but to them few people who do love it - it's so worth it. It's not as glamorous as it looks. You'll blog in your comfortable clothes, probably from your bed sometimes, with no make up on and your hair a mess - and that's okay! Blogging when you're comfortable is a good thing because it really gets your creativeness flowing. Blogging can help with your confidence. Being able to express what you think, or feel, or want to just say it awesome because then you'll find other people who think the same way as you and that will boost your confidence so much knowing that their are people out there that think the same as you do, and you're not alone. You have to be motivated. You have to get yourself in a mind set of "today is a new today, I am going to blog" because a few people I know mix their times up with blogging and social life and I think that's where they get stuck along the way. If you're working or studying 5 days a week and then have 2 days free, literally spend one whole day (like from 8am until 10pm) blogging and then use the Sunday to be social. Don't do a bit of blogging for half an hour or an hour a day because it really won't get you awnyhere. You really have to enjoy what you're doing to be a blogger as it really does take a long time to be noticed, but never give up. Be genuine and stay true to yourself and people will see that. Be positive too as positivity can go a long long way. I was so nervous and scared when I first put a blog post up but what I do believe in the end we only regret the chances we didn't take so I am so grateful that I took that leap outside my comfort zone and put that blog post up for you all to read. Thank you so much to everyone for all of your support this past year, it means so much to me - I love you all! Love that post! !I agree with all of those points! !Blogging really need a lot of time,dedication and sometimes it's hard and people around you don't get it!! Thank you for the great tips and they will come in handy since I am a beginner with blogging but love it! I love this post, and can relate to so much of it! 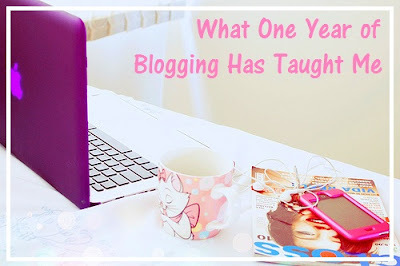 I've been blogging for just over a year and a half now and have learnt so much. The spam (unfortunately) never stops haha, but the community is so wonderful, it more than makes up for it! I really liked this! I've been blogging for just over 2 years and it's been a bit journey. I've learned web design, Photoshop, photography, so many other things!